Congratulations Blair Sharp on the Extra Mile Award! Congratulations to Site Supervisor Blair Sharp who has created a Health and Safety presentation specific to his site, Subsea 7. The presentation was to keep the staff fully trained on health and safety procedures and continual improvement on the site. The presentation was also seen by Head of Health & Safety Chas Bray, who commended Blair on his exceptional work. Well done Blair for going the extra mile and embracing Health and Safety and your commitment to protecting our client and site staff. 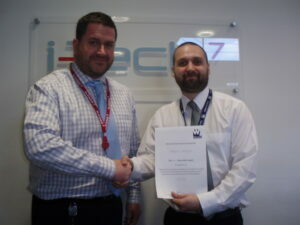 Here is Blair being presented his award Strategic Account Manager, Scott Barclay.